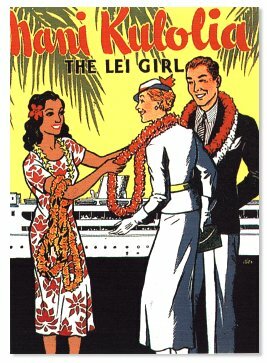 Start off your vacation in paradise with a Hawaiian Arrival Lei Greeting from Waikiki.com! Being given a beautiful Hawaiian lei has been a tradition in Hawaii for years as a gesture of ALOHA (Welcome), affection and love. Experience this wonderful part of the Hawaiian culture as you step off your plane and onto our wonderful Islands! A smiling Hawaiian island greeter holding a personalized welcome sign with your names will present you with one of our beautiful Hawaiian leis. Assistance to the baggage terminal or information on your connecting flight will also be given by your Hawaiian greeter. Just fill out our online Lei Reservation form with the names of your party and flight information and look forward to the start of a spectacular time in paradise! You may even surprise loved ones with Hawaiian leis for their special time in Hawaii. When filling out the reservation form, include a message noting that this is a surprise. Their Hawaiian island greeter will call out their names when they arrive for their surprise greeting! Let us know about your upcoming group vacation or convention in Hawaii and receive awesome discounts. (Groups of 10 or more per flight qualify for discounts). Click Here to Contact Us! *Please include Date, Airlines, Flight Number and Names when you are completing the purchase. Don't be fooled by those other activity people! Waikiki.com is determined to give you the best price on all activities for Hawaii. Check out our prices and experience the Best Vacation in Hawaii!